The New School is committed to rigorous academics and to instilling the Entrepreneurial Mindset in its students. The Entrepreneurial Mindset is defined by four core habits and is a way of perceiving and approaching the world around us. This approach will prepare our students for and help them excel in a rapidly changing workforce and world. Today’s high school students will have fundamentally different career-paths than their parents. Already, data suggests that, unlike their Gen-X and baby boomer predecessors, the majority of millennials aren’t crafting careers out of “traditional” jobs. In a recent Deloitte poll, 70% of millennials said they would reject “traditional business” to work independently after college. Those that do pursue careers in law, medicine and across corporate America, find that bringing a curious mind and entrepreneurial approach to their roles is beneficial, if not required, to get ahead. Some estimates suggest that half of the jobs today’s graduates will have in 20 years don’t even exist today. This isn’t entirely surprising. After all, “social media management” and “search engine optimization” came with companies like Google and Facebook, founded in the 1990s and early 2000s. See Problems as Opportunities. And solving important problems with a combination of creativity and technology – believing that the status quo can be changed for the better. Test, Reflect, Revise. Setbacks are reframed as an intentional and crucial step on the path to success, that also requires constant testing, reflection and revision. Our students learn the lean startup methodology to build, measure and learn from their first day at school. They are not afraid to take risks, take ownership or to make their voice heard. Empathize. Communicating and collaborating effectively with diverse, relevant groups of people, developing empathy. Stick With It. Grit and perseverance are central to the Entrepreneurial Mindset and enable anyone to power through complex problems, no matter the setbacks, and learn when to pivot. These habits define the Entrepreneurial Mindset – a way of thinking that empowers students to independently or collectively explore the questions and problems that matter most to them. So how do we teach the Entrepreneurial Mindset? In their 9th and 10th grade years, much of our students’ time is spent tackling major extended projects, inside and outside the classroom – Learning By Doing. This project work introduces students to the skills they’ll hone in their Junior year as part of our year-long Entrepreneurship Program, a curriculum created by TNS faculty (who have designed similar programs for Village Capital and Social Impact House), in conjunction with TNS community partners like Innovation in Action and Experience Willow. In their Senior year, TNS students work in curated internships with local mentor-professionals, bringing their Entrepreneurial Mindset to the real world. Each project is intentionally mapped to help our students develop competencies, and gain rich experiences and inspiration to develop their Entrepreneurial Mindset. Projects start with problem discovery, and design thinking workshops – like the Homeless Project our students did at the beginning of last year, when students spent time in homeless communities, visited shelters, spoke with experts, and researched in-depth issues affecting the homeless population in our city. They then prototyped, tested, and refined innovations, and went through (many for the first time in their lives) multiple rounds of feedback and revision, ultimately pitching their innovations to a panel of community leaders. One of our teams is still working on their smartphone application, which provides location-based information to the homeless and relevant data to support networks. This kind of learning happens throughout the day, not just during project time. The school day starts with yoga, calisthenics and reflection, followed by student-led current events discussions. Academic classes are project and skills based – with challenging work that requires creative problem solving, not rote learning, and external partnerships (e.g. Theatre Studies with Horizon Theatre, Physics with the MASS Collective Maker Space). Reflection and revision are integrated into all areas of school life. Speakers and mentors play a critical role in projects, classes, and the weekly Entrepreneurial Speaker Series. And the day ends with our innovative extracurricular programs. The creative aspect of these extracurricular programs highlights a key element in the Entrepreneurial Mindset: creative problem solving. A recent paper by an Oxford University institute suggests that up to 47% of American jobs could be vulnerable to automation within the next couple of decades. New jobs that will take their place will largely require both analytic firepower, and creativity. Our TNS-X program, an extension of the school day, combines creative arts with technology and innovation through programs like Drone Design, App Development, Improv Comedy, and Audio Production – led by passionate, committed, accomplished adults who take our students and their work seriously, building products and inspiring them to produce professional quality work. These aren’t clubs or after school activities, but a whole other layer of intense learning designed to develop the Entrepreneurial Mindset. At The New School, we believe that this kind of work doesn’t have to happen at the expense of rigorous academics. We push our students hard academically to prepare them for top colleges. But they also have multiple outlets to make and develop creativity, learn practical technologies for the modern workplace (spreadsheets, project management and surveying tools, design software), and learn to build and maintain relationships. Perhaps most importantly, TNS students are more engaged in class because they are seeing the applications of the skills and content they are required to learn in real world situations. A recent Harvard study has shown that jobs that require both socializing and thinking (especially mathematically) have fared best in employment and pay over the past 20 years. In a future blog post, we’ll talk about how we help our students develop that critical human element to get ahead – their people skills, ability to network and build relationships, and more importantly become inspired to do more Learning by Doing, and develop the Entrepreneurial Mindset. 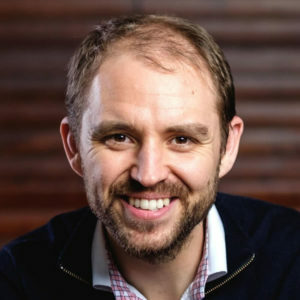 James is a Co-Founder and the Director of Innovation at TNS. James has taught more than 20 different high school classes in math, economics, physics, music and entrepreneurship over the last decade. Prior to the New School, James was employee #1 and Global Program Director at Village Capital, where he helped launch a network of impact accelerator programs on five continents, and a seed-stage fund facilitating peer-selected investments in more than 40 startups.